Digital humanities (DH) is an area of scholarly activity at the intersection of computing or digital technologies and the disciplines of the humanities. It includes the systematic use of digital resources in the humanities, as well as the reflection on their application. DH can be defined as new ways of doing scholarship that involve collaborative, transdisciplinary, and computationally engaged research, teaching, and publishing. It brings digital tools and methods to the study of the humanities with the recognition that the printed word is no longer the main medium for knowledge production and distribution. By producing and using new applications and techniques, DH makes new kinds of teaching and research possible, while at the same time studying and critiquing how these impact cultural heritage and digital culture. Thus, a distinctive feature of DH is its cultivation of a two-way relationship between the humanities and the digital: the field both employs technology in the pursuit of humanities research and subjects technology to humanistic questioning and interrogation, often simultaneously. The definition of the digital humanities is being continually formulated by scholars and practitioners. Since the field is constantly growing and changing, specific definitions can quickly become outdated or unnecessarily limit future potential. The second volume of Debates in the Digital Humanities (2016) acknowledges the difficulty in defining the field: "Along with the digital archives, quantitative analyses, and tool-building projects that once characterized the field, DH now encompasses a wide range of methods and practices: visualizations of large image sets, 3D modeling of historical artifacts, 'born digital' dissertations, hashtag activism and the analysis thereof, alternate reality games, mobile makerspaces, and more. In what has been called 'big tent' DH, it can at times be difficult to determine with any specificity what, precisely, digital humanities work entails." Historically, the digital humanities developed out of humanities computing and has become associated with other fields, such as humanistic computing, social computing, and media studies. In concrete terms, the digital humanities embraces a variety of topics, from curating online collections of primary sources (primarily textual) to the data mining of large cultural data sets to topic modeling. Digital humanities incorporates both digitized (remediated) and born-digital materials and combines the methodologies from traditional humanities disciplines (such as rhetoric, history, philosophy, linguistics, literature, art, archaeology, music, and cultural studies) and social sciences, with tools provided by computing (such as hypertext, hypermedia, data visualisation, information retrieval, data mining, statistics, text mining, digital mapping), and digital publishing. Related subfields of digital humanities have emerged like software studies, platform studies, and critical code studies. Fields that parallel the digital humanities include new media studies and information science as well as media theory of composition, game studies, particularly in areas related to digital humanities project design and production, and cultural analytics. Berry and Fagerjord have suggested that a way to reconceptualise digital humanities could be through a "digital humanities stack". They argue that "this type of diagram is common in computation and computer science to show how technologies are 'stacked' on top of each other in increasing levels of abstraction. Here, [they] use the method in a more illustrative and creative sense of showing the range of activities, practices, skills, technologies and structures that could be said to make up the digital humanities, with the aim of providing a high-level map." Indeed, the "diagram can be read as the bottom levels indicating some of the fundamental elements of the digital humanities stack, such as computational thinking and knowledge representation, and then other elements that later build on these. " Digital humanities descends from the field of humanities computing, whose origins reach back to the 1930s and 1940s in the pioneering work of English professor Josephine Miles and Jesuit scholar Roberto Busa and the women they employed. In collaboration with IBM, they created a computer-generated concordance to Thomas Aquinas' writings known as the Index Thomisticus. Other scholars began using mainframe computers to automate tasks like word-searching, sorting, and counting, which was much faster than processing information from texts with handwritten or typed index cards. In the decades which followed archaeologists, classicists, historians, literary scholars, and a broad array of humanities researchers in other disciplines applied emerging computational methods to transform humanities scholarship. As Tara McPherson has pointed out, the digital humanities also inherit practices and perspectives developed through many artistic and theoretical engagements with electronic screen culture beginning the late 1960s and 1970s. These range from research developed by organizations such as SIGGRAPH to creations by artists such as Charles and Ray Eames and the members of E.A.T. (Experiments in Art and Technology). The Eames and E.A.T. explored nascent computer culture and intermediality in creative works that dovetailed technological innovation with art. The first specialized journal in the digital humanities was Computers and the Humanities, which debuted in 1966. The Association for Literary and Linguistic Computing (ALLC) and the Association for Computers and the Humanities (ACH) were then founded in 1977 and 1978, respectively. Soon, there was a need for a standardized protocol for tagging digital texts, and the Text Encoding Initiative (TEI) was developed. The TEI project was launched in 1987 and published the first full version of the TEI Guidelines in May 1994. TEI helped shape the field of electronic textual scholarship and led to Extensible Markup Language (XML), which is a tag scheme for digital editing. Researchers also began experimenting with databases and hypertextual editing, which are structured around links and nodes, as opposed to the standard linear convention of print. In the nineties, major digital text and image archives emerged at centers of humanities computing in the U.S. (e.g. the Women Writers Project, the Rossetti Archive, and The William Blake Archive), which demonstrated the sophistication and robustness of text-encoding for literature. The advent of personal computing and the World Wide Web meant that Digital Humanities work could become less centered on text and more on design. The multimedia nature of the internet has allowed Digital Humanities work to incorporate audio, video, and other components in addition to text. The terminological change from "humanities computing" to "digital humanities" has been attributed to John Unsworth, Susan Schreibman, and Ray Siemens who, as editors of the anthology A Companion to Digital Humanities (2004), tried to prevent the field from being viewed as "mere digitization." Consequently, the hybrid term has created an overlap between fields like rhetoric and composition, which use "the methods of contemporary humanities in studying digital objects," and digital humanities, which uses "digital technology in studying traditional humanities objects". The use of computational systems and the study of computational media within the arts and humanities more generally has been termed the 'computational turn'. In 2006 the National Endowment for the Humanities (NEH) launched the Digital Humanities Initiative (renamed Office of Digital Humanities in 2008), which made widespread adoption of the term "digital humanities" all but irreversible in the United States. Digital humanities emerged from its former niche status and became "big news" at the 2009 MLA convention in Philadelphia, where digital humanists made "some of the liveliest and most visible contributions" and had their field hailed as "the first 'next big thing' in a long time." Although digital humanities projects and initiatives are diverse, they often reflect common values and methods. These can help in understanding this hard-to-define field. In keeping with the value of being open and accessible, many digital humanities projects and journals are open access and/or under Creative Commons licensing, showing the field's "commitment to open standards and open source." Open access is designed to enable anyone with an internet-enabled device and internet connection to view a website or read an article without having to pay, as well as share content with the appropriate permissions. Digital humanities scholars use computational methods either to answer existing research questions or to challenge existing theoretical paradigms, generating new questions and pioneering new approaches. One goal is to systematically integrate computer technology into the activities of humanities scholars, as is done in contemporary empirical social sciences. Yet despite the significant trend in digital humanities towards networked and multimodal forms of knowledge, a substantial amount of digital humanities focuses on documents and text in ways that differentiate the field's work from digital research in media studies, information studies, communication studies, and sociology. Another goal of digital humanities is to create scholarship that transcends textual sources. This includes the integration of multimedia, metadata, and dynamic environments (see The Valley of the Shadow project at the University of Virginia, the Vectors Journal of Culture and Technology in a Dynamic Vernacular at University of Southern California, or Digital Pioneers projects at Harvard). A growing number of researchers in digital humanities are using computational methods for the analysis of large cultural data sets such as the Google Books corpus. Examples of such projects were highlighted by the Humanities High Performance Computing competition sponsored by the Office of Digital Humanities in 2008, and also by the Digging Into Data challenge organized in 2009 and 2011 by NEH in collaboration with NSF, and in partnership with JISC in the UK, and SSHRC in Canada. In addition to books, historical newspapers can also be analyzed with big data methods. The analysis of vast quantities of historical newspaper content has showed how periodic structures can be automatically discovered, and a similar analysis was performed on social media. As part of the big data revolution, Gender bias, readability, content similarity, reader preferences, and even mood have been analyzed based on text mining methods over millions of documents and historical documents written in literary Chinese. Digital humanities is also involved in the creation of software, providing "environments and tools for producing, curating, and interacting with knowledge that is 'born digital' and lives in various digital contexts." In this context, the field is sometimes known as computational humanities. Digital humanities scholars use a variety of digital tools for their research, which may take place in an environment as small as a mobile device or as large as a virtual reality lab. Environments for "creating, publishing and working with digital scholarship include everything from personal equipment to institutes and software to cyberspace." Some scholars use advanced programming languages and databases, while others use less complex tools, depending on their needs. DiRT (Digital Research Tools Directory) offers a registry of digital research tools for scholars. TAPoR (Text Analysis Portal for Research) is a gateway to text analysis and retrieval tools. An accessible, free example of an online textual analysis program is Voyant Tools, which only requires the user to copy and paste either a body of text or a URL and then click the 'reveal' button to run the program. There is also an online list of online or downloadable Digital Humanities tools that are largely free, aimed toward helping students and others who lack access to funding or institutional servers. Free, open source web publishing platforms like WordPress and Omeka are also popular tools. Digital humanities projects are more likely than traditional humanities work to involve a team or a lab, which may be composed of faculty, staff, graduate or undergraduate students, information technology specialists, and partners in galleries, libraries, archives, and museums. Credit and authorship are often given to multiple people to reflect this collaborative nature, which is different from the sole authorship model in the traditional humanities (and more like the natural sciences). The Women Writers Project (begun in 1988) is a long-term research project to make pre-Victorian women writers more accessible through an electronic collection of rare texts. The Walt Whitman Archive (begun in the 1990s) sought to create a hypertext and scholarly edition of Whitman's works and now includes photographs, sounds, and the only comprehensive current bibliography of Whitman criticism. The Emily Dickinson Archive (begun in 2013) is a collection of high-resolution images of Dickinson's poetry manuscripts as well as a searchable lexicon of over 9,000 words that appear in the poems. Example of network analysis as an archival tool at the League of Nations. The Slave Societies Digital Archive (formerly Ecclesiastical and Secular Sources for Slave Societies), directed by Jane Landers and hosted at Vanderbilt University, preserves endangered ecclesiastical and secular documents related to Africans and African-descended peoples in slave societies. This Digital Archive currently holds 500,000 unique images, dating from the 16th to the 20th centuries, and documents the history of between 6 and 8 million individuals. They are the most extensive serial records for the history of Africans in the Atlantic World and also include valuable information on the indigenous, European, and Asian populations who lived alongside them. The involvement of librarians and archivists plays an important part in digital humanities projects because of the recent expansion of their role so that it now covers digital curation, which is critical in the preservation, promotion, and access to digital collections, as well as the application of scholarly orientation to digital humanities projects. A specific example involves the case of initiatives where archivists help scholars and academics build their projects through their experience in evaluating, implementing, and customizing metadata schemas for library collections. The initiatives at the National Autonomous University of Mexico is another example of a digital humanities project. These include the digitization of 17th-century manuscripts, an electronic corpus of Mexican history from the 16th to 19th century, and the visualization of pre-Hispanic archaeological sites in 3-D.
"Cultural analytics" refers to the use of computational method for exploration and analysis of large visual collections and also contemporary digital media. The concept was developed in 2005 by Lev Manovich who then established the Cultural Analytics Lab in 2007 at Qualcomm Institute at California Institute for Telecommunication and Information (Calit2). The lab has been using methods from the field of computer science called Computer Vision many types of both historical and contemporary visual media—for example, all covers of Time magazine published between 1923 and 2009, 20,000 historical art photographs from the collection in Museum of Modern Art (MoMA) in New York, one million pages from Manga books, and 16 million images shared on Instagram in 17 global cities. Cultural analytics also includes using methods from media design and data visualization to create interactive visual interfaces for exploration of large visual collections e.g., Selfiecity and On Broadway. Cultural Analytics research is also addressing a number of theoretical questions. How can we "observe" giant cultural universes of both user-generated and professional media content created today, without reducing them to averages, outliers, or pre-existing categories? How can work with large cultural data help us question our stereotypes and assumptions about cultures? What new theoretical cultural concepts and models are required for studying global digital culture with its new mega-scale, speed, and connectivity? The term "cultural analytics" (or "culture analytics") is now used by many other researchers, as exemplified by two academic symposiums, a four-month long research program at UCLA that brought together 120 leading researchers from university and industry labs, an academic peer-review Journal of Cultural Analytics: CA established in 2016, and academic job listings. WordHoard (begun in 2004) is a free application that enables scholarly but non-technical users to read and analyze, in new ways, deeply-tagged texts, including the canon of Early Greek epic, Chaucer, Shakespeare, and Spenser. The Republic of Letters (begun in 2008) seeks to visualize the social network of Enlightenment writers through an interactive map and visualization tools. Network analysis and data visualization is also used for reflections on the field itself – researchers may produce network maps of social media interactions or infographics from data on digital humanities scholars and projects. A 2017 study published in the Proceedings of the National Academy of Sciences of the United States of America compared the trajectory of n-grams over time in both digitised books from the 2010 Science article with those found in a large corpus of regional newspapers from the United Kingdom over the course of 150 years. The study further went on to use more advanced Natural language processing techniques to discover macroscopic trends in history and culture, including gender bias, geographical focus, technology, and politics, along with accurate dates for specific events. The Stanford Encyclopedia of Philosophy (begun in 1995) is a dynamic reference work of terms, concepts, and people from philosophy maintained by scholars in the field. MLA Commons offers an open peer-review site (where anyone can comment) for their ongoing curated collection of teaching artifacts in Digital Pedagogy in the Humanities: Concepts, Models, and Experiments (2016). The Debates in the Digital Humanities platform contains volumes of the open-access book of the same title (2012 and 2016 editions) and allows readers to interact with material by marking sentences as interesting or adding terms to a crowdsourced index. "Some key questions include: how do we make the invisible become visible in the study of software? How is knowledge transformed when mediated through code and software? What are the critical approaches to Big Data, visualization, digital methods, etc.? How does computation create new disciplinary boundaries and gate-keeping functions? What are the new hegemonic representations of the digital – 'geons', 'pixels', 'waves', visualization, visual rhetorics, etc.? How do media changes create epistemic changes, and how can we look behind the 'screen essentialism' of computational interfaces? Here we might also reflect on the way in which the practice of making-visible also entails the making-invisible – computation involves making choices about what is to be captured. " Klein and Gold note that many appearances of the digital humanities in public media are often in a critical fashion. Armand Leroi, writing in The New York Times, discusses the contrast between the algorithmic analysis of themes in literary texts and the work of Harold Bloom, who qualitatively and phenomenologically analyzes the themes of literature over time. Leroi questions whether or not the digital humanities can provide a truly robust analysis of literature and social phenomenon or offer a novel alternative perspective on them. The literary theorist Stanley Fish claims that the digital humanities pursue a revolutionary agenda and thereby undermine the conventional standards of "pre-eminence, authority and disciplinary power." However, digital humanities scholars note that "Digital Humanities is an extension of traditional knowledge skills and methods, not a replacement for them. Its distinctive contributions do not obliterate the insights of the past, but add and supplement the humanities' long-standing commitment to scholarly interpretation, informed research, structured argument, and dialogue within communities of practice". Some have hailed the digital humanities as a solution to the apparent problems within the humanities, namely a decline in funding, a repeat of debates, and a fading set of theoretical claims and methodological arguments. Adam Kirsch, writing in the New Republic, calls this the "False Promise" of the digital humanities. While the rest of humanities and many social science departments are seeing a decline in funding or prestige, the digital humanities has been seeing increasing funding and prestige. Burdened with the problems of novelty, the digital humanities is discussed as either a revolutionary alternative to the humanities as it is usually conceived or as simply new wine in old bottles. Kirsch believes that digital humanities practitioners suffer from problems of being marketers rather than scholars, who attest to the grand capacity of their research more than actually performing new analysis and when they do so, only performing trivial parlor tricks of research. This form of criticism has been repeated by others, such as in Carl Staumshein, writing in Inside Higher Education, who calls it a "Digital Humanities Bubble". Later in the same publication, Straumshein alleges that the digital humanities is a 'Corporatist Restructuring' of the Humanities. Some see the alliance of the digital humanities with business to be a positive turn that causes the business world to pay more attention, thus bringing needed funding and attention to the humanities. If it were not burdened by the title of digital humanities, it could escape the allegations that it is elitist and unfairly funded. There has also been critique of the use of digital humanities tools by scholars who do not fully understand what happens to the data they input and place too much trust in the "black box" of software that cannot be sufficiently examined for errors. Johanna Drucker, a professor at UCLA Department of Information Studies, has criticized the "epistemological fallacies" prevalent in popular visualization tools and technologies (such as Google's n-gram graph) used by digital humanities scholars and the general public, calling some network diagramming and topic modeling tools "just too crude for humanistic work." The lack of transparency in these programs obscures the subjective nature of the data and its processing, she argues, as these programs "generate standard diagrams based on conventional algorithms for screen display...mak[ing] it very difficult for the semantics of the data processing to be made evident." There has also been some recent controversy among practitioners of digital humanities around the role that race and/or identity politics plays. Tara McPherson attributes some of the lack of racial diversity in digital humanities to the modality of UNIX and computers themselves. An open thread on DHpoco.org recently garnered well over 100 comments on the issue of race in digital humanities, with scholars arguing about the amount that racial (and other) biases affect the tools and texts available for digital humanities research. McPherson posits that there needs to be an understanding and theorizing of the implications of digital technology and race, even when the subject for analysis appears not to be about race. Amy E. Earhart criticizes what has become the new digital humanities "canon" in the shift from websites using simple HTML to the usage of the TEI and visuals in textual recovery projects. Works that has been previously lost or excluded were afforded a new home on the internet, but much of the same marginalizing practices found in traditional humanities also took place digitally. According to Earhart, there is a "need to examine the canon that we, as digital humanists, are constructing, a canon that skews toward traditional texts and excludes crucial work by women, people of color, and the LGBTQ community." Practitioners in digital humanities are also failing to meet the needs of users with disabilities. George H. Williams argues that universal design is imperative for practitioners to increase usability because "many of the otherwise most valuable digital resources are useless for people who are—for example—deaf or hard of hearing, as well as for people who are blind, have low vision, or have difficulty distinguishing particular colors." In order to provide accessibility successfully, and productive universal design, it is important to understand why and how users with disabilities are using the digital resources while remembering that all users approach their informational needs differently. Digital humanities have been criticized for not only ignoring traditional questions of lineage and history in the humanities, but lacking the fundamental cultural criticism that defines the humanities. However, it remains to be seen whether or not the humanities have to be tied to cultural criticism, per se, in order to be the humanities. The sciences[vague] might imagine the Digital Humanities as a welcome improvement over the non-quantitative methods of the humanities and social sciences. As the field matures, there has been a recognition that the standard model of academic peer-review of work may not be adequate for digital humanities projects, which often involve website components, databases, and other non-print objects. Evaluation of quality and impact thus require a combination of old and new methods of peer review. One response has been the creation of the DHCommons Journal. This accepts non-traditional submissions, especially mid-stage digital projects, and provides an innovative model of peer review more suited for the multimedia, transdisciplinary, and milestone-driven nature of Digital Humanities projects. Other professional humanities organizations, such as the American Historical Association and the Modern Language Association, have developed guidelines for evaluating academic digital scholarship. The 2012 edition of Debates in the Digital Humanities recognized the fact that pedagogy was the "neglected 'stepchild' of DH" and included an entire section on teaching the digital humanities. Part of the reason is that grants in the humanities are geared more toward research with quantifiable results rather than teaching innovations, which are harder to measure. In recognition of a need for more scholarship on the area of teaching, Digital Humanities Pedagogy was published and offered case studies and strategies to address how to teach digital humanities methods in various disciplines. ADHO funds a number of projects such as the Digital Humanities Quarterly journal and the Digital Scholarship in the Humanities (DSH) journal, supports the Text Encoding Initiative, and sponsors workshops and conferences, as well as funding small projects, awards, and bursaries. HASTAC (Humanities, Arts, Science, and Technology Alliance and Collaboratory) is a free and open access virtual, interdisciplinary community focused on changing teaching and learning through the sharing of news, tools, methods, and pedagogy, including digital humanities scholarship. It is reputed to be the world's first and oldest academic social network. ^ Drucker, Johanna (September 2013). "Intro to Digital Humanities: Introduction". UCLA Center for Digital Humanities. Retrieved December 26, 2016. ^ a b Terras, Melissa (December 2011). "Quantifying Digital Humanities" (PDF). UCL Centre for Digital Humanities. Retrieved December 26, 2016. ^ a b c d e f g h i j k Burdick, Anne; Drucker, Johanna; Lunenfeld, Peter; Presner, Todd; Schnapp, Jeffrey (November 2012). Digital_Humanities (PDF). Open Access eBook: MIT Press. ISBN 9780262312097. Archived from the original (PDF) on 2016-10-26. Retrieved 2016-12-26. ^ Warwick, Claire; Terras, Melissa; Nyhan, Julianne (2012-10-09). Digital Humanities in Practice. Facet Publishing. ISBN 9781856047661. ^ a b c "Debates in the Digital Humanities". dhdebates.gc.cuny.edu. Retrieved 2016-12-29. ^ "Digital Humanities Network". University of Cambridge. Retrieved 27 December 2012. ^ Berry, David M.; Fagerjord (2017). Digital Humanities: Knowledge and Critique in a Digital Age. UK: Polity. p. 18. ISBN 9780745697666. ^ Berry, David M.; Fagerjord (2017). Digital Humanities: Knowledge and Critique in a Digital Age. UK: Polity. p. 19. ISBN 9780745697666. ^ Heffernan, Laura; Sagner Buurma, Rachel (2018-04-11). "Search and Replace: Josephine Miles and the Origins of Distant Reading". Modernism / Modernity Print+. 3 (1). Retrieved 2018-08-17. ^ Svensson, Patrik (2009). "Humanities Computing as Digital Humanities". Digital Humanities Quarterly. 3 (3). ISSN 1938-4122. Retrieved 2012-05-30. ^ Feeney, Mary & Ross, Seamus (1994). "Information Technology in Humanities Scholarship, British Achievements, Prospects, and Barriers". Historical Social Research. 19 (1 (69)): 3–59. JSTOR 20755828. ^ a b Berry, David M.; Fagerjord, Anders (2017). Digital Humanities: Knowledge and Critique in a Digital Age. Cambridge: Polity. ISBN 978-0-7456-9765-9. ^ McPherson, Tara. "DH by Design: Feminism, aesthetics + the digital." Congress of the Social Science and Humanities. University of Calgary, 2016-05-31. Keynote. ^ Liu, Alan (2004). "Transcendental Data: Toward a Cultural History and Aesthetics of the New Encoded Discourse". Critical Inquiry. 31 (1): 49–84. doi:10.1086/427302. ISSN 0093-1896. JSTOR 10.1086/427302. ^ a b c Fitzpatrick, Kathleen (2011-05-08). "The humanities, done digitally". The Chronicle of Higher Education. Retrieved 2011-07-10. ^ Berry, David (2011-06-01). "The Computational Turn: Thinking About the Digital Humanities". Culture Machine. Retrieved 2012-01-31. ^ a b Kirschenbaum, Matthew G. (2010). "What is Digital Humanities and What's it Doing in English Departments?" (PDF). ADE Bulletin (150). ^ Howard, Jennifer (2009-12-31). "The MLA Convention in Translation". The Chronicle of Higher Education. ISSN 0009-5982. Retrieved 2012-05-31. ^ Pannapacker, William (2009-12-28). "The MLA and the Digital Humanities" (The Chronicle of Higher Education). Brainstorm. Retrieved 2012-05-30. ^ a b Honn, Josh. "A Guide to Digital Humanities: Values Methods". Northwestern University Library. Archived from the original on 19 September 2015. Retrieved 19 September 2015. ^ Find accessible, brief descriptions of each at A Guide to Digital Humanities archived site. ^ "Harvard University Arts & Humanities Research Computing – Harvard University Arts & Humanities Research Computing". Harvard University Arts & Humanities Research Computing. ^ Roth, S. (2014), "Fashionable functions. A Google n-gram view of trends in functional differentiation (1800-2000)", International Journal of Technology and Human Interaction, Band 10, Nr. 2, S. 34-58 (online: http://ssrn.com/abstract=2491422). ^ Bobley, Brett (December 1, 2008). "Grant Announcement for Humanities High Performance Computing Program". National Endowment for the Humanities. Archived from the original on September 26, 2012. Retrieved May 1, 2012. ^ "Awardees of 2009 Digging into Data Challenge". Digging into Data. 2009. Archived from the original on May 17, 2012. Retrieved May 1, 2012. ^ "NEH Announces Winners of 2011 Digging Into Data Challenge". National Endowment for the Humanities. January 3, 2012. Retrieved May 1, 2012. ^ Cohen, Patricia (2010-11-16). "Humanities Scholars Embrace Digital Technology". The New York Times. New York. ISSN 0362-4331. Retrieved 2012-06-07. ^ Williford, Christa; Henry, Charles (June 2012). "Computationally Intensive Research in the Humanities and Social Sciences: A Report on the Experiences of First Respondents to the Digging Into Data Challenge". Council on Library and Information Resources. ISBN 978-1-932326-40-6. ^ Dzogang, Fabon; Lansdall-Welfare, Thomas; Team, FindMyPast Newspaper; Cristianini, Nello (2016-11-08). "Discovering Periodic Patterns in Historical News". PLOS ONE. 11 (11): e0165736. doi:10.1371/journal.pone.0165736. ISSN 1932-6203. PMC 5100883. PMID 27824911. ^ Flaounas, I.; Turchi, M.; Ali, O.; Fyson, N.; Bie, T. De; Mosdell, N.; Lewis, J.; Cristianini, N. (2010). "The Structure of EU Mediasphere". PLoS ONE. 5 (12): e14243. doi:10.1371/journal.pone.0014243. PMC 2999531. PMID 21170383. ^ Lampos, V; Cristianini, N (2012). "Nowcasting Events from the Social Web with Statistical Learning". ACM Transactions on Intelligent Systems and Technology (TIST). 3 (4): 72. doi:10.1145/2337542.2337557. ^ a b Lansdall-Welfare, Thomas; Sudhahar, Saatviga; Thompson, James; Lewis, Justin; Team, FindMyPast Newspaper; Cristianini, Nello (2017-01-09). "Content analysis of 150 years of British periodicals". Proceedings of the National Academy of Sciences. 114 (4): E457–E465. doi:10.1073/pnas.1606380114. ISSN 0027-8424. PMC 5278459. PMID 28069962. ^ Presner, Todd (2010). "Digital Humanities 2.0: A Report on Knowledge". Connexions. Retrieved 2012-06-09. ^ Gardiner, Eileen and Ronald G. Musto. (2015). The Digital Humanities: A Primer for Students and Scholars. Cambridge: Cambridge University Press, p. 83. ^ "Welcome // - DiRT Directory". dirtdirectory.org. ^ "TAPoR". tapor-test.artsrn.ualberta.ca. Archived from the original on 2017-09-29. ^ "dhresourcesforprojectbuilding [licensed for non-commercial use only] / Digital Humanities Tools". dhresourcesforprojectbuilding.pbworks.com. ^ See CUNY Academic Commons Wiki Archive for more. ^ "The Walt Whitman Archive". www.whitmanarchive.org. ^ League of Nations archives, United Nations Office in Geneva. 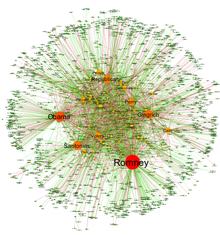 Network visualization and analysis published in Grandjean, Martin (2014). "La connaissance est un réseau". Les Cahiers du Numérique. 10 (3): 37–54. doi:10.3166/lcn.10.3.37-54. Retrieved 2014-10-15. ^ "Homepage". Slave Societies Digital Archive. ^ "People". Department of History. ^ Sabharwal, Arjun (2015). Digital Curation in the Digital Humanities: Preserving and Promoting Archival and Special Collections. Waltham, MA: Elsevier. p. 27. ISBN 9780081001431. ^ Sacco, Kathleen (2015). Supporting Digital Humanities for Knowledge Acquisition in Modern Libraries. Hershey, PA: IGI Global. p. 22. ISBN 9781466684447. ^ Warwick, Claire; Terras, Melissa; Nyhan (2012). Digital Humanities in Practice. London: Facet Publishing. p. 203. ISBN 9781856047661. ^ "Timeline: 4535 Time Magazine Covers, 1923-2009". ^ "A View from Above: Exploratory Visualizations of MoMA Photography Collection". ^ "Exploring One Million Manga Pages with Supercomputers and HIPerSpace". ^ Manovich, Lev (2017). Instagram and Contemporary Image. ^ "Cultural Analytics: Computational Approaches to the Study of Culture", the University of Chicago, May 2015 and "Cultural Analytics symposium", Notre Dame University, May 2017. ^ "Culture Analytics program", Institute for Pure and Applied Mathematics (IPAM), UCLA, March 7–June 10, 2016. ^ "Journal of Cultural Analytics: CA". ^ "Mapping the Republic of Letters". National Endowment for the Humanities. Retrieved 2016-12-26. ^ Cohen, Patricia (16 December 2010). "In 500 Billion Words, New Window on Culture". New York Times. ^ Hayes, Brian (May–June 2011). "Bit Lit". American Scientist. 99 (3): 190. doi:10.1511/2011.90.190. Archived from the original on 2016-10-18. Retrieved 2017-01-16. ^ Letcher, David W. (April 6, 2011). "Cultoromics: A New Way to See Temporal Changes in the Prevalence of Words and Phrases" (PDF). American Institute of Higher Education 6th International Conference Proceedings. 4 (1): 228. ^ a b Michel, Jean-Baptiste; Liberman Aiden, Erez (16 December 2010). "Quantitative Analysis of Culture Using Millions of Digitized Books". Science. 331 (6014): 176–82. doi:10.1126/science.1199644. PMC 3279742. PMID 21163965. ^ "MLA Commons – An online community for MLA members". ^ "Digital Pedagogy in the Humanities - MLA Commons". ^ "Debates in the Digital Humanities". ^ a b Berry, David M.; Fagerjord (2017). Digital Humanities: Knowledge and Critique in a Digital Age. UK: Polity. p. 137. ISBN 9780745697666. ^ a b Liu, Alan. "Where is Cultural Criticism in the Digital Humanities?". UCSB. Retrieved 14 May 2016. ^ Fish, Stanley (2012-01-09). "The Digital Humanities and the Transcending of Mortality". The New York Times. New York. Retrieved 2012-05-30. ^ Leroi, Armand. "Digitizing the Humanities". The New York Times Online. The New York Times. Retrieved 14 May 2016. ^ Kirsch, Adam. "Technology Is Taking Over English Departments". The New Republic. The New Republic. Retrieved 14 May 2016. ^ Straumshein, Carl. "Digital Humanities Bubble". Inside Higher Education. Retrieved 14 May 2016. ^ Straumshein, Carl. "Digital Humanities as 'Corporatist Restructuring'". Inside Higher Education. Inside Higher Education. Retrieved 14 May 2016. ^ Carlson, Tracy. "Humanities and business go hand in hand". The Boston Globe. Retrieved 14 May 2016. ^ Pannapacker, William. "Stop Calling It 'Digital Humanities'". Chronicle of Higher Education. Retrieved 14 May 2016. ^ Dobson, James E. (2015). "Can an Algorithm be Disturbed? Machine Learning, Intrinsic Criticism, and the Digital Humanities". College Literature. 42 (4): 543–564. ^ a b "Johanna Drucker (UCLA) Lecture, "Should Humanists Visualize Knowledge?"". Vimeo. Retrieved 2016-01-25. ^ "Open Thread: The Digital Humanities as a Historical "Refuge" from Race/Class/Gender/Sexuality/Disability?". Archived from the original on 2013-12-03. ^ a b "Debates in the Digital Humanities". dhdebates.gc.cuny.edu. ^ a b George H. Williams. "Disability, Universal Design, and the Digital Humanities". Debates in the Digital Humanities. ^ "Poetry in Motion". Nature. Nature. Retrieved 14 May 2016. ^ Kirschenbaum, Matthew. "What Is "Digital Humanities," and Why Are They Saying Such Terrible Things about It?" (PDF). Wordpress. Matthew Kirschenbaum. Retrieved 14 May 2016. ^ "Guidelines for Evaluating Work in Digital Humanities and Digital..." Modern Language Association. Retrieved 2017-02-13. ^ "Guidelines for the Professional Evaluation of Digital Scholarship by Historians | AHA". www.historians.org. Retrieved 2017-02-13. ^ "About | ADHO". adho.org. Retrieved 2016-12-26. ^ Vanhoutte, Edward (2011-04-01). "Editorial". Literary and Linguistic Computing. 26 (1): 3–4. doi:10.1093/llc/fqr002. Retrieved 2011-07-11. ^ a b "About HASTAC". HASTAC. Retrieved 2016-12-26. ^ "Lancaster University - Digital Humanities Hub". Retrieved 13 March 2019. ^ "FCGL – Forensic Computational Geometry Laboratory". Retrieved 12 September 2018. Beagle, Donald, (2014). Digital Humanities in the Research Commons: Precedents & Prospects, Association of College & Research Libraries: dh+lib. Benzon, William; Hays, David (1976). "Computational Linguistics and the Humanist". Computers and the Humanities. 10 (5): 265–274. doi:10.1007/bf02420060. Berry, D. M., ed. (2012). Understanding Digital Humanities, Basingstoke: Palgrave Macmillan. Berry, D. M., Fagerjord, A. (2017). Digital Humanities: Knowledge and Critique in a Digital Age, London: Polity. Celentano, A., Cortesi, A. & Mastandrea, P. (2004). Informatica Umanistica: una disciplina di confine, Mondo Digitale, vol. 4, pp. 44–55. Classen, Christoph, Kinnebrock, Susanne, & Löblich, Maria, eds. (2012). Towards Web History: Sources, Methods, and Challenges in the Digital Age. Historical Social Research, 37 (4), 97-188. Condron Frances, Fraser, Michael & Sutherland, Stuart, eds. (2001). Oxford University Computing Services Guide to Digital Resources for the Humanities, West Virginia University Press. Gardiner, Eileen and Ronald G. Musto. (2015). The Digital Humanities: A Primer for Students and Scholars. Cambridge: Cambridge University Press. Gold, Matthew K., ed. (2012). Debates In the Digital Humanities. Minneapolis: University of Minnesota Press. Grandjean, Martin (2016). "A social network analysis of Twitter: Mapping the digital humanities community". Cogent Arts & Humanities. 3 (1): 1171458. doi:10.1080/23311983.2016.1171458. Hancock, B.; Giarlo, M.J. (2001). "Moving to XML: Latin texts XML conversion project at the Center for Electronic Texts in the Humanities". Library Hi Tech. 19 (3): 257–264. doi:10.1108/07378830110405139. Heftberger, Adelheid (2016). Kollision der Kader. Dziga Vertovs Filme, die Visualisierung ihrer Strukturen und die Digital Humanities. Munich: edition text + kritik. Hockey, Susan (2001). Electronic Text in the Humanities: Principles and Practice, Oxford: Oxford University Press. Honing, Henkjan (2008). "The role of ICT in music research: A bridge too far?". International Journal of Humanities and Arts Computing. 1 (1): 67–75. doi:10.3366/E1753854808000104. Inman James, Reed, Cheryl, & Sands, Peter, eds. (2003). Electronic Collaboration in the Humanities: Issues and Options, Mahwah, NJ: Lawrence Erlbaum. Kenna, Stephanie & Ross, Seamus, eds. (1995). Networking in the humanities: Proceedings of the Second Conference on Scholarship and Technology in the Humanities held at Elvetham Hall, Hampshire, UK 13–16 April 1994. London: Bowker-Saur. Kirschenbaum, Matthew (2008). Mechanisms: New Media and the Forensic Imagination. Cambridge, Mass. : MIT Press. Manovich, Lev (2013). 'Software Takes Command. London and New York: Bloomsbury Academic. McCarty, Willard (2005). Humanities Computing, Basingstoke: Palgrave Macmillan. Moretti, Franco (2007). Graphs, Maps, Trees: Abstract Models for Literary History. New York: Verso. Mullings, Christine, Kenna, Stephanie, Deegan, Marilyn, & Ross, Seamus, eds. (1996). New Technologies for the Humanities London: Bowker-Saur. Newell, William H., ed. (1998). Interdisciplinarity: Essays from the Literature. New York: College Entrance Examination Board. Schreibman, Susan, Siemens, Ray & Unsworth, John, eds. (2004). A Companion To Digital Humanities Blackwell Publishers. Selfridge-Field, Eleanor, ed. (1997). Beyond MIDI: The Handbook of Musical Codes. Cambridge, MA: The MIT Press. Thaller, Manfred (2012). "Controversies around the Digital Humanities". Historical Social Research. 37 (3): 7–229. Archived from the original on 2013-07-17. Swirski, Peter. (2013). From Literature to Biterature: Lem, Turing, Darwin, and Explorations in Computer Literature, Philosophy of Mind, and Cultural Evolution, MQUP. Tötösy de Zepetnek, Steven (2013). Digital Humanities and the Study of Intermediality in Comparative Cultural Studies. Ed. Steven Tötösy de Zepetnek. West Lafayette: Purdue Scholarly Publishing Services. Unsworth, John (2005). Scholarly Primitives: What methods do humanities researchers have in common, and how might our tools reflect this? Lansdall-Welfare, T; Sudhahar, S; Thompson, J; Lewis, J; Cristianini, N (2017). "Content analysis of 150 years of British periodicals". Proc Natl Acad Sci U S A. 114 (4): 201606380. doi:10.1073/pnas.1606380114. PMID 28069962. .
Wikimedia Commons has media related to Digital humanities.